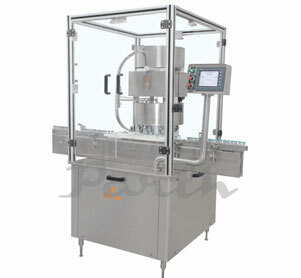 Automatic VIAL Cap Sealing Machine is versatile, self-supported on stainless steel leg with height adjustable adjustment system. The machine is precision built on sturdy welded MS frame completely enclose in stainless steel sheet and doors are providing to facilitate the servicing of machine. The feed Vial moving on conveyor belt are fed into an indeed star wheel through In-feed worm, star wheel bringing the Vial below the sealing head in the subsequent indexing part, mean while the Vials pickup a cap from the delivery chute of cap filling bowl, where the body and the neck of the Vial are positioned below the rotating head, where the sealing head is performing perfect operation of threading & sealing. Electrical Specification** Main Motor 1.0 HP / 415 Volts / 50 Hz. Cap Feeding Bowl 300 watt magnetic coil. Net Weight 350 Kgs. Approx. Gross Weight 750 Kgs. Approx. No Vial no cap arrangement. Specially designed hopper is provided to increase storage capacity of bowl. Synchronized A/C drives to synchronize, Conveyor, Star wheel and Platform turret & capping bowl. Adjustable Vials height gauge for easy and quick setting. Acrylic cabinet for safety work. Cap feeder empty machine stop system.